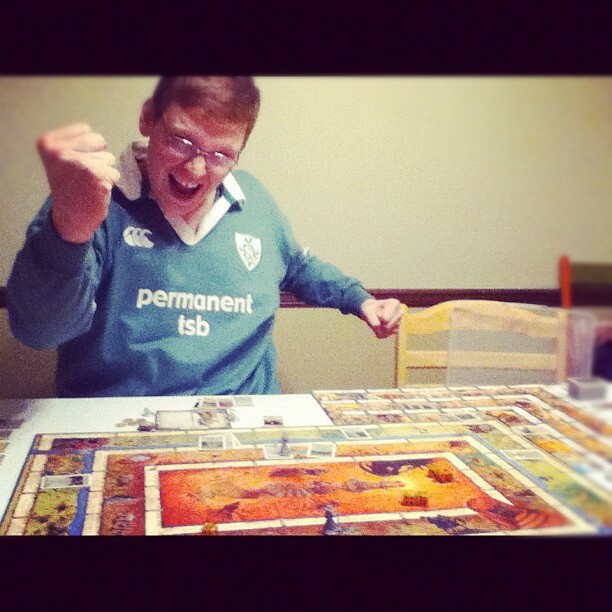 This is how Talisman makes me feel. San Il Defanso is the name on the blog, but my name is Nate Owens. I live in Garland, TX. I am a stay-at-home dad, and I’m currently pursuing a graduate degree in Conflict Resolution at Southern Methodist University. Though I write about a lot of different stuff, The Rumpus Room is mainly a blog about hobby board games. I’ve been writing about board games since 2007, when I published my first review on Board Game Geek. That eventually became a blog in 2010, and that gradually took shape as The Rumpus Room. For a few years I also had a weekly column on Fortress: Ameritrash, where I am still somewhat active in the forums. I also write reviews for Miniature Market’s Review Corner. My favorite games tend to have lots of luck or lots of interaction. I like strong theme, but I’m not so hung up on it that I require it to enjoy the game. My favorite games are old school thematic games like Cosmic Encounter, Talisman, and Wiz-War, and classic German games like Tigris & Euphrates, Ra, and Manila. But really I’m something of an omnivorous gamer, and I like a wide variety of stuff. Mostly I just want to play games with other cool people. I game regularly at DFW Nerd Night events, and I appear now and then at Dallas Games Marathon weekends. If you are in the DFW area you should check out those events, and maybe we can play something. Your initial comment looked spammy to me, that’s all. I actually know the guy who wrote about his dad’s books, which is why he got a pass. I’ll restore the first comment if it’s that big a deal to you, but please stop trying to pester me with other comments and accusations of “censorship.” That WILL get you banned if you keep it up. Spam should look so good ! The original comment has been restored.